One thing that my very first styling boss impressed upon me was the need to wrap up the day with a tidy desk and working space. (It was part of this post a couple weeks ago, too.) No matter how crazy the day or how many clothes were strewn about in the closet at noon, come closing time everything was in it’s right place. She said it was the only way to start a new day fresh and she was right. 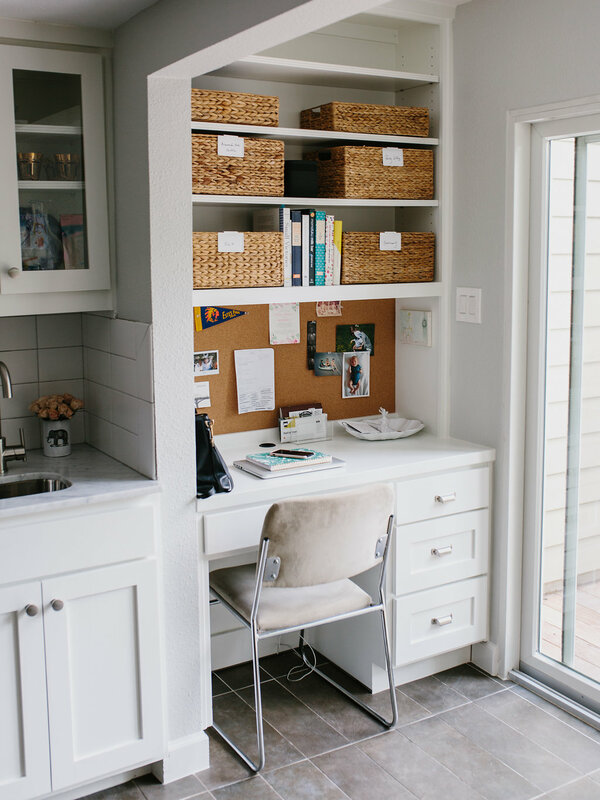 When we were touring Margaret’s West Austin abode, we couldn’t get over this organized office nook that she created in her kitchen. It feels like the epicenter of family life, housing everything from cookbooks and important papers to stamps and stationary. It’s also the perfect tucked away corner from which she can correspond with clients and strategize upcoming work projects when working from home. (Margaret runs the Austin-based organization company, Edit Spaces.) 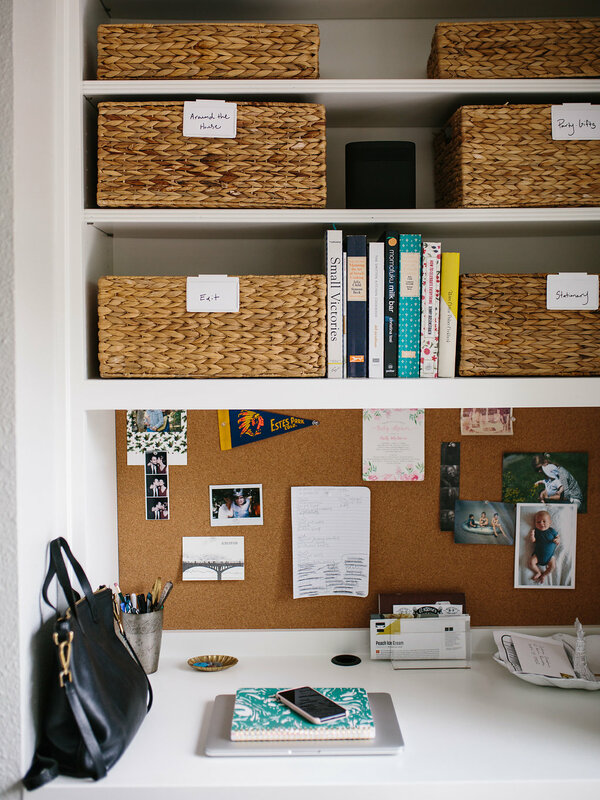 Keep reading as she shares her tips for carving out your own work space, even when you don’t have a home office, and how to keep it all organized, of course. 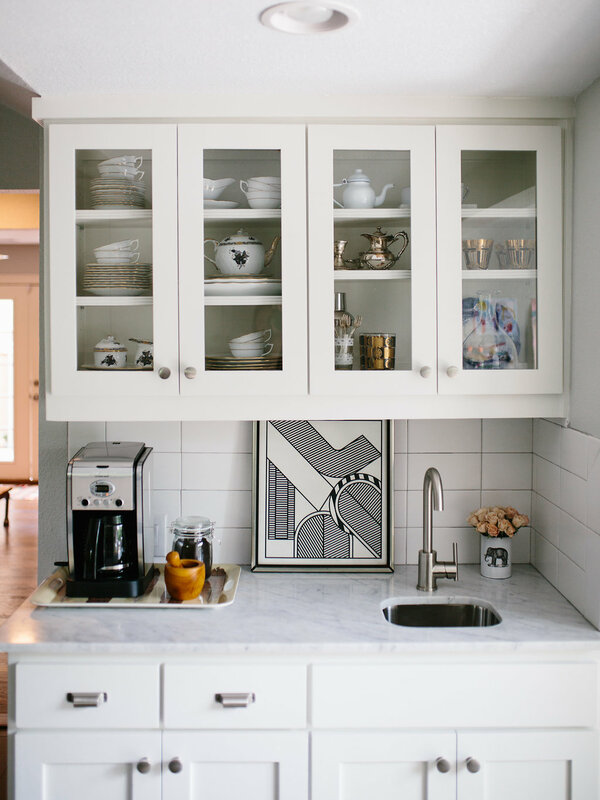 Jen: I love how you created this nook within your kitchen and how well it flows with the space. Any other suggestions for people wanting a similar desk space, but who don’t have an extra bedroom to devote to an office? Margaret: I feel so lucky to have this space! I didn’t even realize how much I wanted my own nook until I had it. 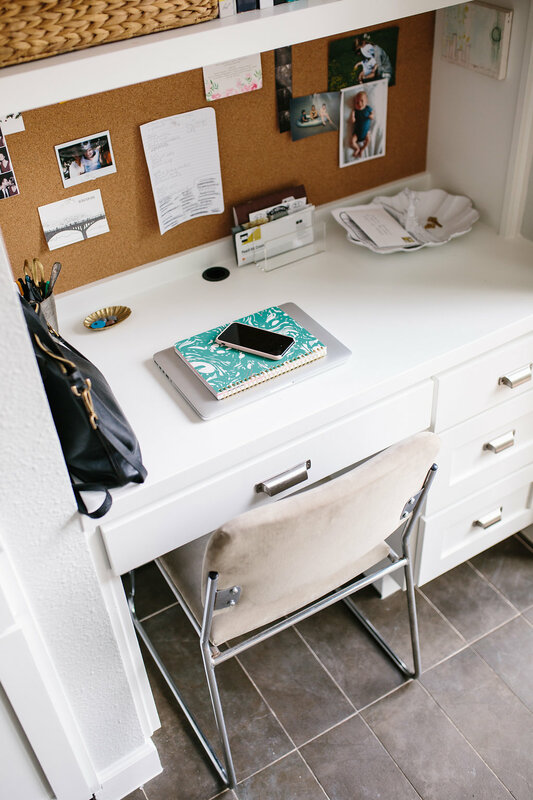 But of course not everyone has a separate office space and until recently I was in the same spot so I know from personal experience there are tricks to creating “zones” within your home. First, try and find figure out which piece of furniture in your home can double time – whether it be an entry piece that is equally a work table or possibly an accent table in your bedroom. Then set it up for it’s primary function but make sure and leave it open enough so there is room for a computer and notepad (go easy on the styling) and it never hurts to strategically place a pretty tray to hold a few basics. 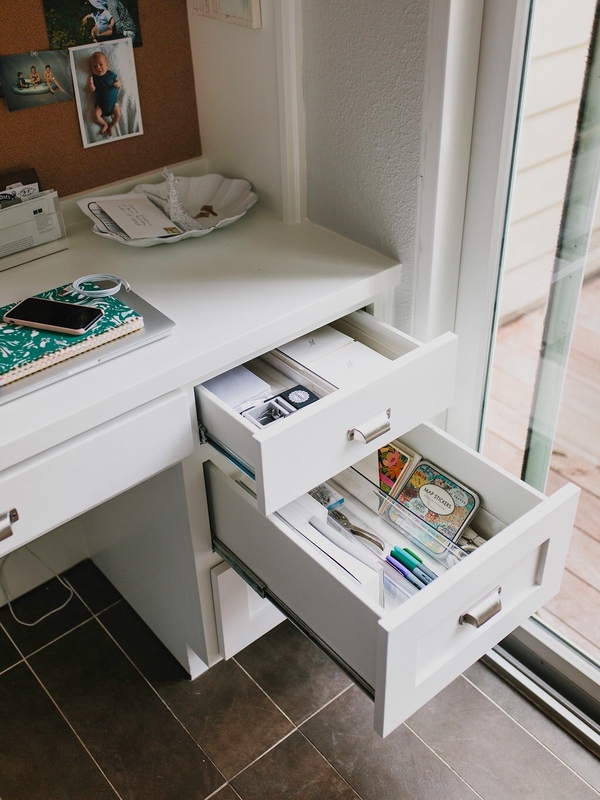 Once you have found your spot set aside a bin or two elsewhere in the house (closet, pantry, laundry room) with all of your chargers, stationary, files or whatever you need to be up and running while working. Pro tip ~ make sure this space is right by a plug so while you are working you can be charging. 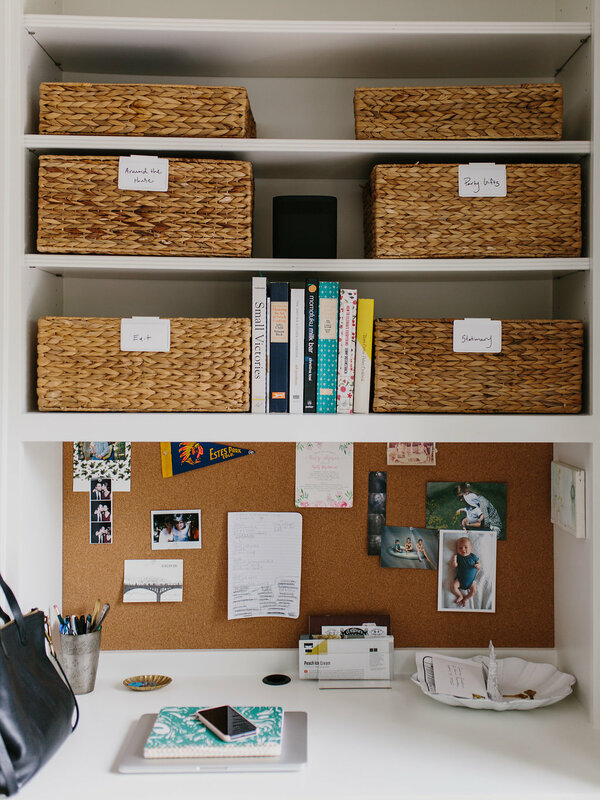 Jen: How do you determine what goes on the desk, in the drawers, or in the baskets? Margaret: On the desk is only the bare minimum and things you always need to access or reference. In my case this is writing material + a few sentimental tchotchkes + bills and mail that needs to be dealt with immediately. 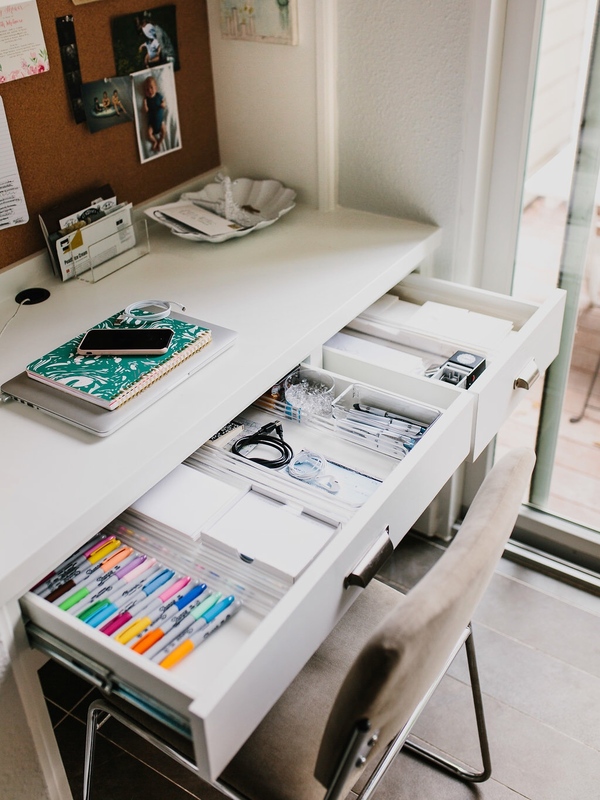 I suggest reserving desk drawer space for small items that are either a) not that cute (headphones) b) private (checkbooks) or c ) need to be divided up in order to stay organized (stationary, extra pens, rubber bands, etc). That leaves bins which are perfect for larger items and broader categories. One example being “Around The House” which can include anything from blue tape to furniture felt pads – the category is clear enough to not be a dumping ground (see you later chargers, you belong with technology!) but broad enough that I don’t need to obsessively keep it organized. Jen: What are your desk essentials that you can’t live without? Margaret: Drawer dividers! The easiest way to keep things tidy without trying too hard! Plus labeled bins that function as categorized inboxes…i.e. kids school, work, paper goods. And I always try and use pretty flea market finds to hold pens, scissors, and change instead of using designated desktop supplies (although I do love Poppin) which is a great way to integrate this space with the rest of your home. Or in my case justify my love for flea markets! 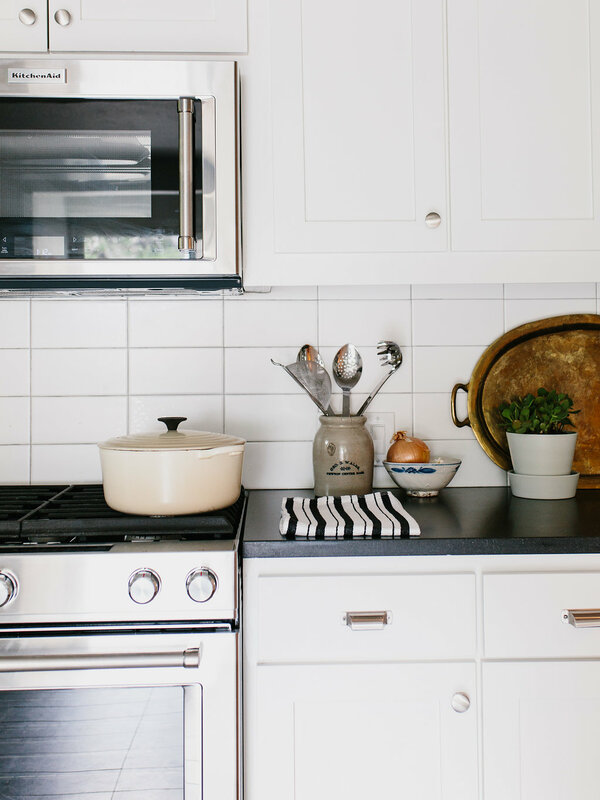 Jen: You are such a natural when it comes to keeping an organized space. Any tips for those of us who have to work a little harder at it?! 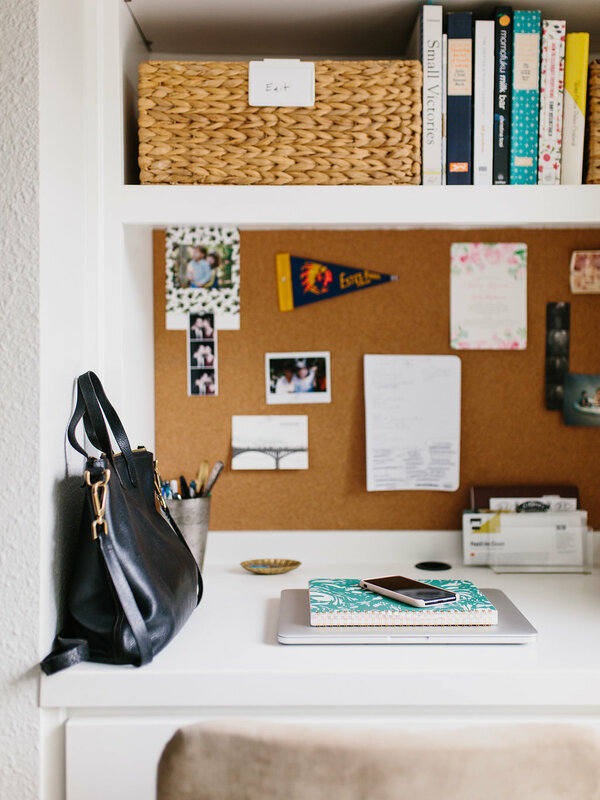 How do you keep your desk area uncluttered on the regular? Any methods or routines for not allowing things to build up? Margaret: Absolutely! 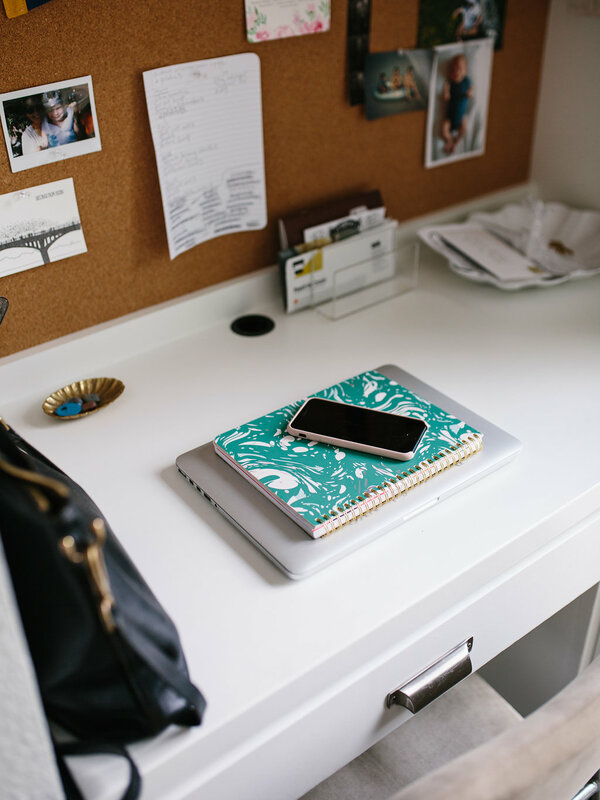 My tip is to set boundaries – I clean up my desk surface at the end of every day but maybe you do it every Friday to close out the week (and start Monday) on a together note. And in that same spirit I would suggest giving your bins a pass through once a quarter as you will inevitably find papers that need to be filed or recycled, among other treasures and junk. This way you have freedom to be a little messy knowing that there is a plan for cleaning out and organizing. The goal is to never let things get so crazy that you become completely overwhelmed by stuff. Jen: Any tips for other moms running a family and a business from home? 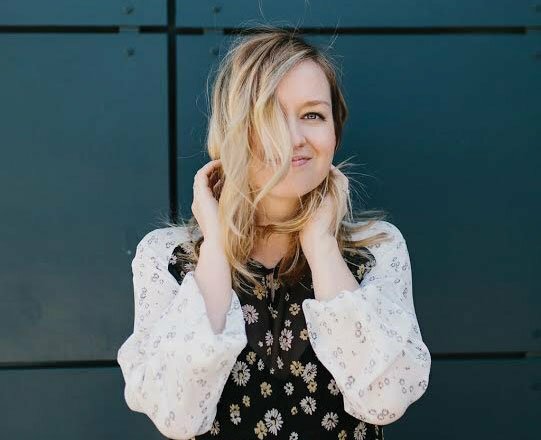 Margaret: Oh gosh I am sure I have the same struggles that anyone else does, but I have found that compartmentalizing is the way to go. When I am with my kids I try (emphasize try) and leave my phone in my bedroom or purse and when I am working I write out a very specific and realistic to-do list and don’t step away from my desk until it’s done. Quite honestly I am beginning to think multitasking is overrated – I tend to get more done, or enjoy free time more, when I see one thing through from start to finish. And when all else fails I use the oldest trick in the book – leaving my house! Nothing creates focus like getting away from other distractions. To hire Margaret for your own organizing endeavors, check out her site here. I’m loving the little baskets above the desk! They are such a great way to keep organized, yet they look super fun and stylish. My desk needs a serious overhaul. Until we get into our new house, our dining room table is our desk and we are sharing a closet for supplies in the nursery with the new babe on the way… I feel your pain! My husband and i did a 30 day declutter at the beginning of the year and I ended up switching desks with him and set up a little nook. I love it. It just feels so much better to have an organized space to go to. I’m so into this idea! Was there a certain format that you followed or did you just pick a different space to tackle every day? 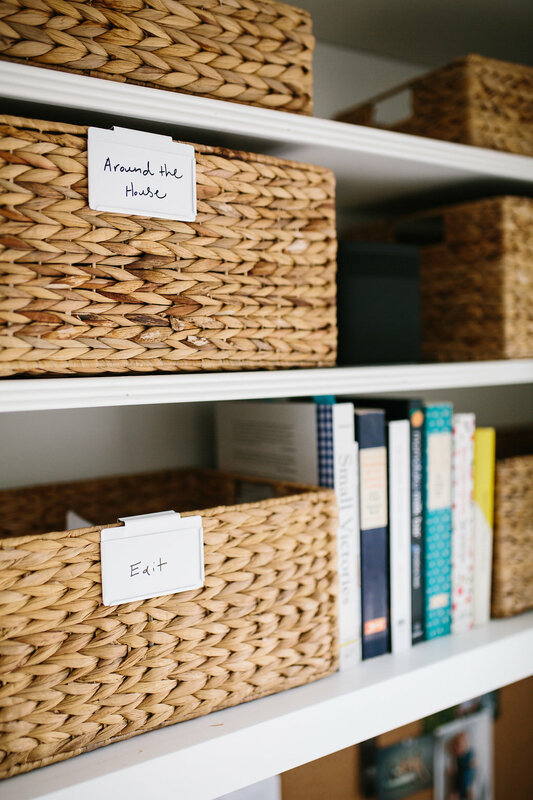 The baskets are a great Idea to keep those odds and ends out of sight. I have to say though, i cannot wait to take mY Desk out of the kitchen. It’s not as tucked away as margaret’s and the kids use it as a dumpibg ground every time they walk by. Even tackling it at the end of every day is an undertaking. I like that her desk sits apart in its own space. I can totally see how that could happen. Maybe there is a way to create a basket or a drawer that is just for the kids to put their stuff? Then all of their things can go in there and you can have a designated day or two for sorting it? This little office nook is perfect! Isn’t it?! 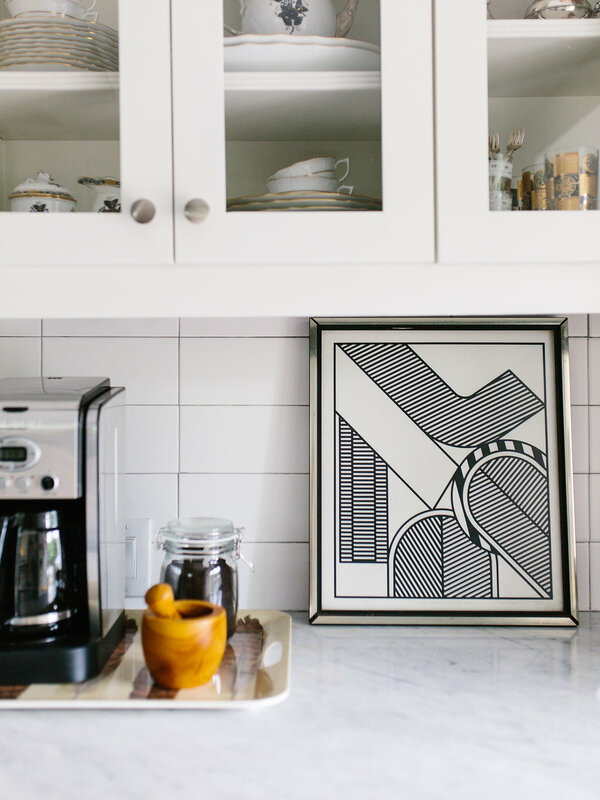 I love the way it blends in seamlessly in her kitchen too!